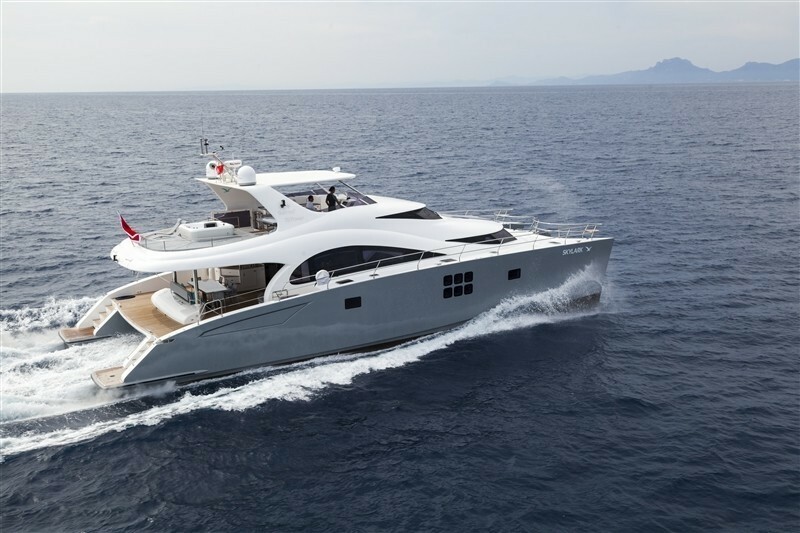 Constructed by one of the top catamaran builders, Sunreef Yachts, the 21m luxury motor yacht Skylark is a splendid 70 Sunreef Power series vessel, launched in 2012. 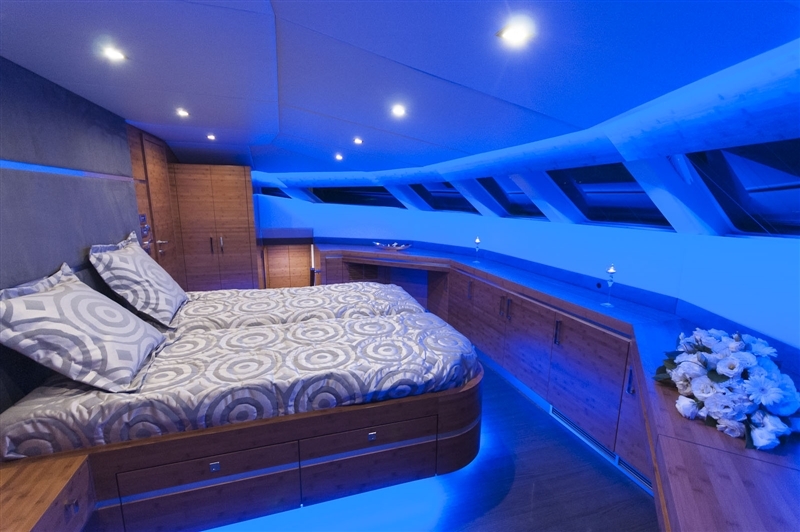 The Skylark yacht boasts stability as well as comfort in cruising, along with an extended living and storage space thanks to her large beam, and amazing exterior space, as well as oceanic range combined with very low fuel consumption. 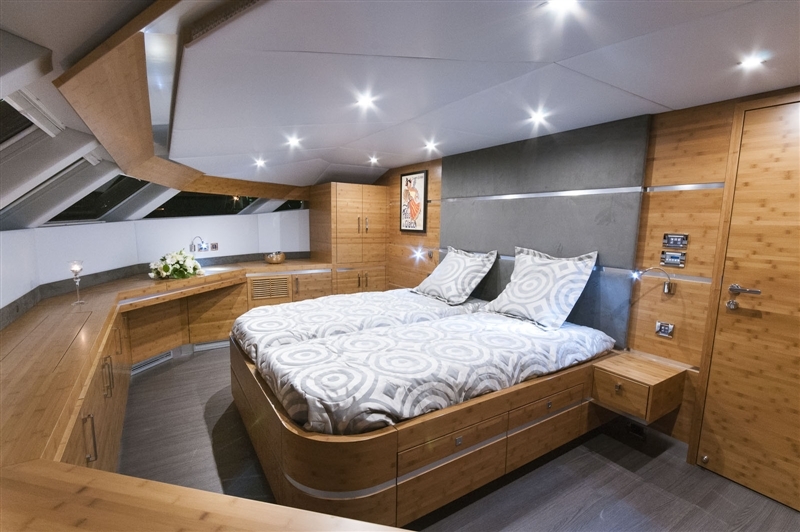 The magnificent 70 Sunreef Power yacht Skylark provides comfortable accommodation in a beam-wide owner suite in the forward section and four double cabins in the hulls. 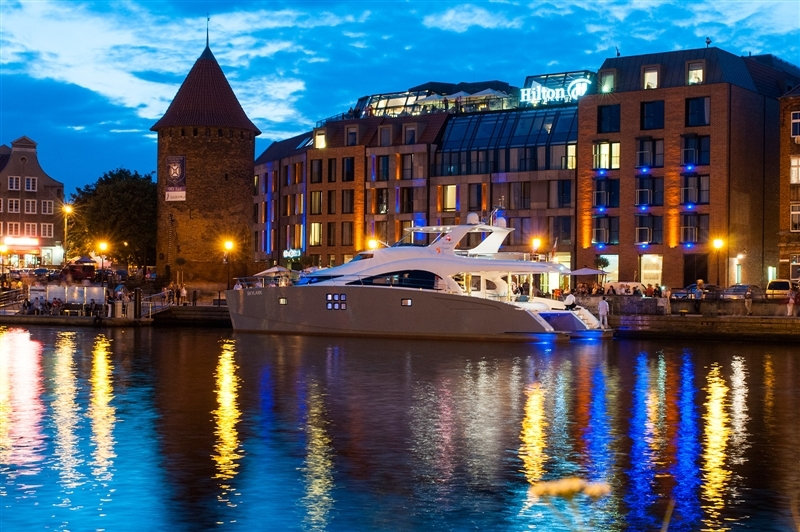 These include one VIP and two double cabins for the guests, and one double cabin for the crew. 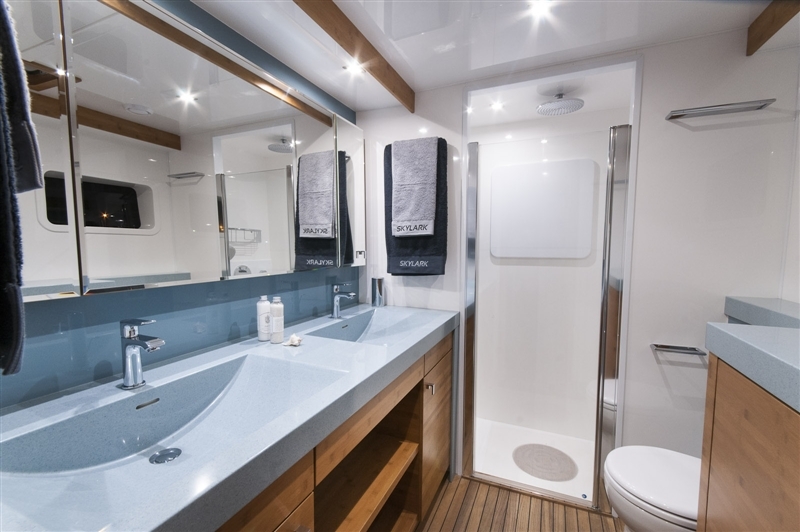 All cabins feature their private en-suite bathrooms, extended storage, TV and DVD as well as fantastic visibility through 6 large port holes in the hulls. 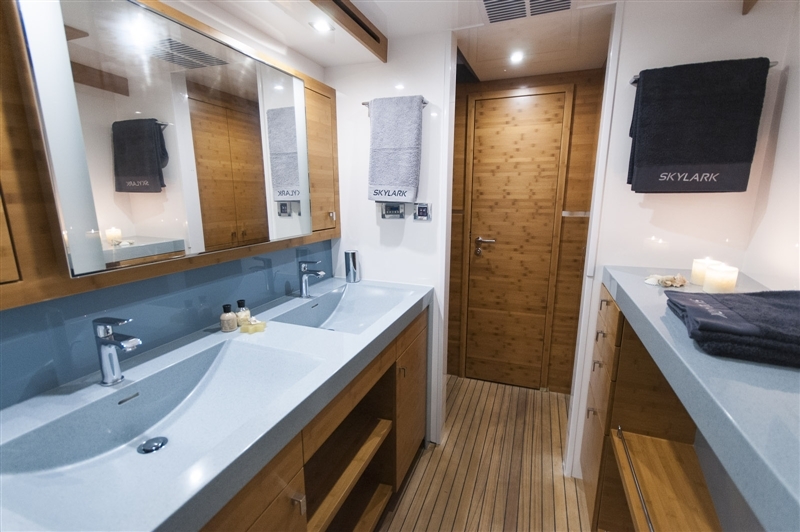 Main saloon has dining area for 8-10 guests and fully equipped galley with comfortable bar. 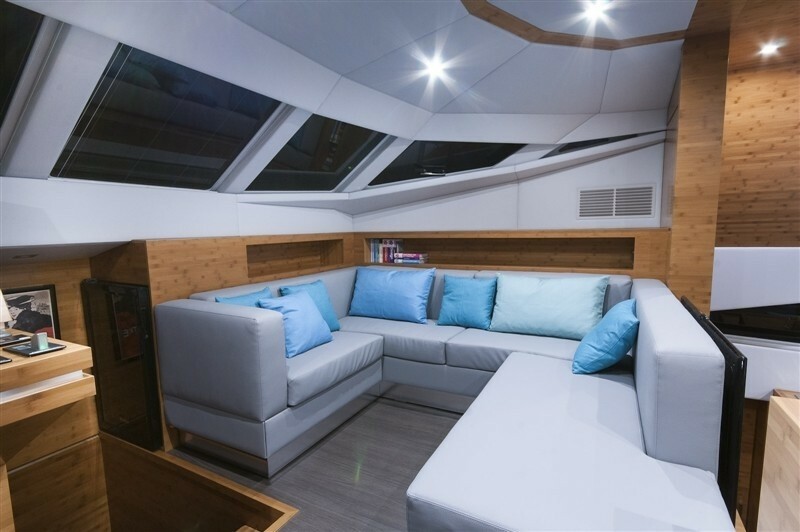 Mezzanine floor, separating the saloon and the owner suite, houses internal helm station with the latest navcom system by Raymarine and a cozy lounge corner. 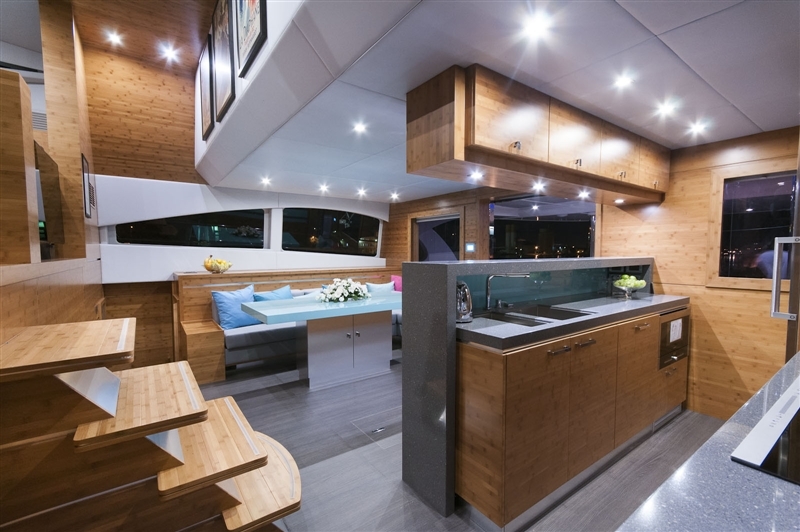 Both the cockpit and the flybridge are excellent decks for outdoor living. 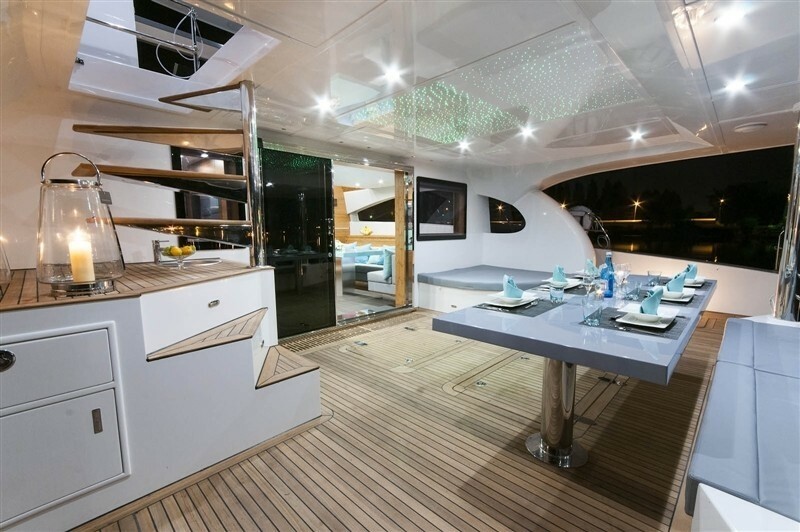 The cockpit features large dining table for 8-10 guests, sun pads and extensive storage space for a large number of water toys, comprising sea bobs, diving gear as well as a big 4,5m tender. 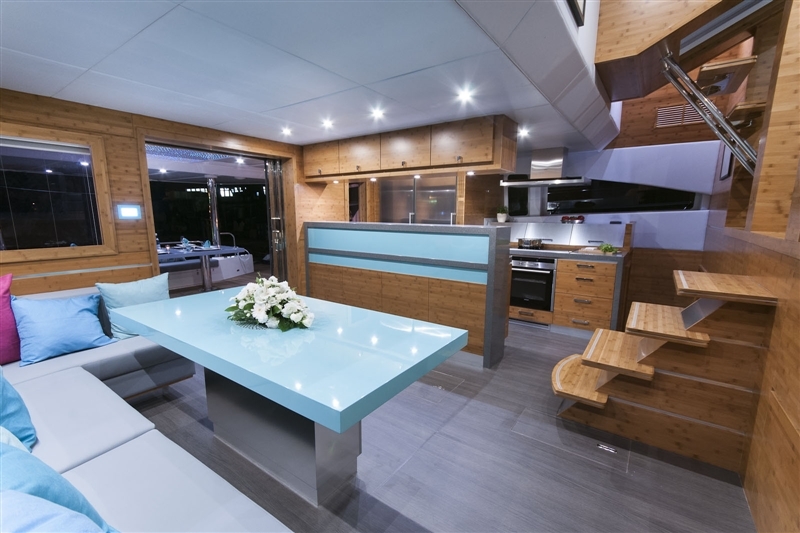 It also has a handy fridge and sink. 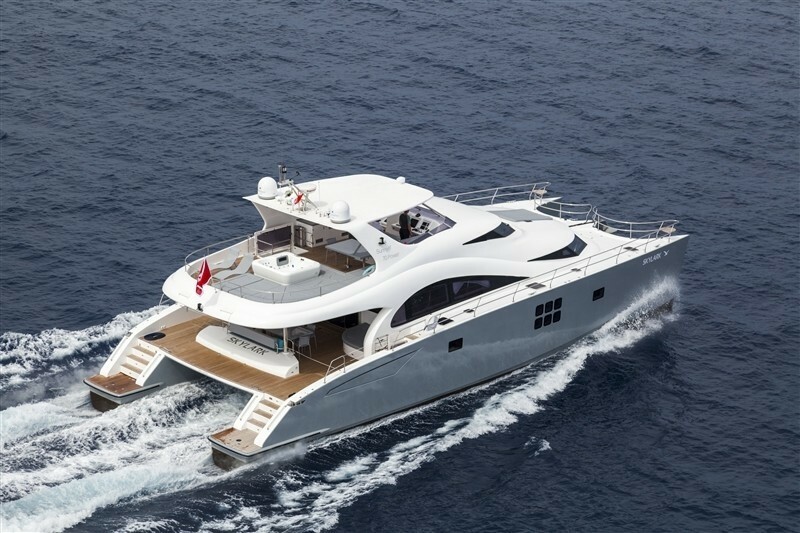 The flybridge accommodates a Spa Pool, sun pads, dining area, wet bar with barbecue and main helm station. 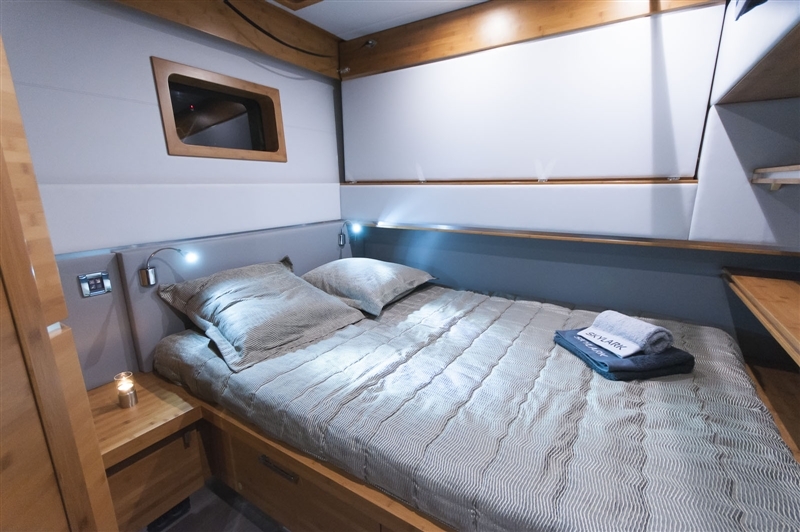 It can be easily accessed from the cockpit and internal helm station. 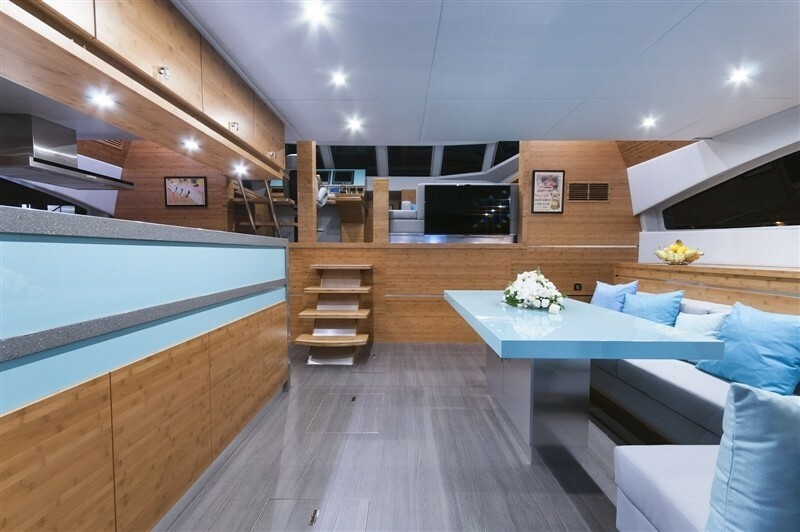 Beautiful interior design of the 70 Sunreef Power yacht Skylark mixes caramel bamboo wood with pearl gray upholstery, aquamarine table tops and decorative elements such as cushions and wall panels. The result is a very relaxing and pleasurable general ambience. 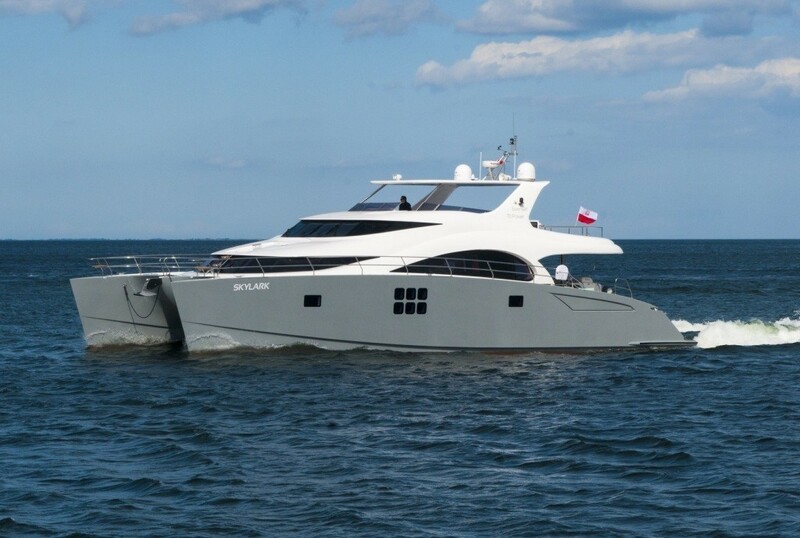 Skylark yacht is powered by twin 455 - 1001 HP engines. 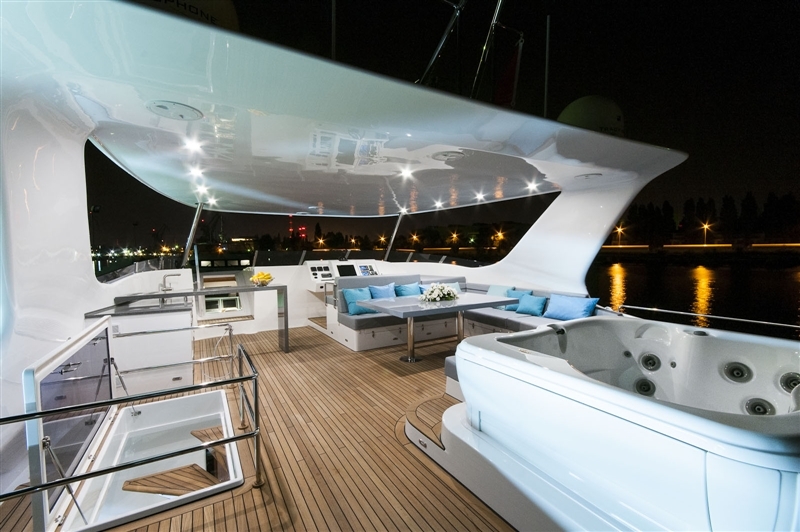 Her maximum beam is of 9,3m (30'51''), while her draft is of 1,45m (4'76''). 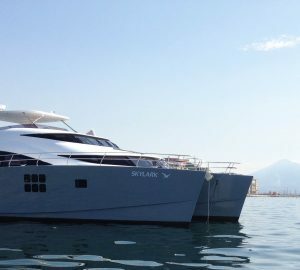 Measuring 21 meters in length, the 70 Sunreef Power yacht Skylark offers her guests 4 lovely and comfortable cabins. 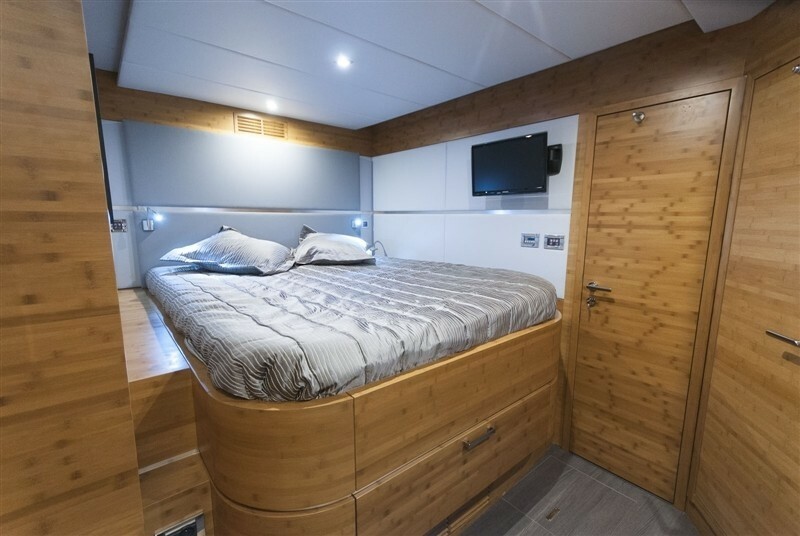 These include a beam-wide owner suite in the forward section, while one VIP and two double cabins are situated in the hulls. 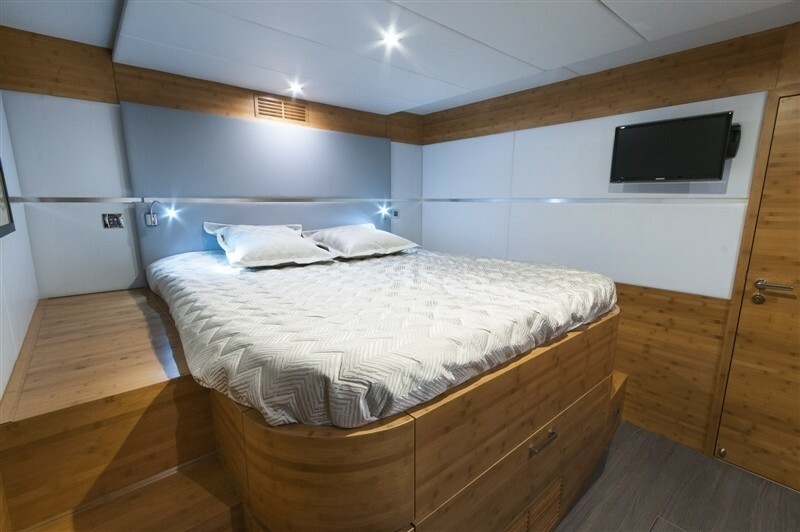 Her crew sleeps in one double crew cabin.